Bale durin his unveilin as a Real Madrid player in September 2013. Gareth Frank Bale (born 16 Julie 1989) is a Welsh fitbawer who plays for La Liga club Real Madrid an the Wales national team as a winger. Bale began his profeesional career at Southampton, playin at left back an earnin acclaim as a free kick specialist. He muivit tae Tottenham Hotspur in 2007, for a eventual £7 million fee. Durin his time at Spurs, managerial an tactical shifts saw him transform intae a mair affensively-orientatit player. 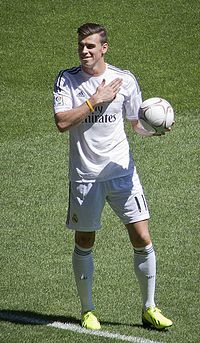 Frae the 2009–10 saison, Bale became a integral pairt o the team, risin tae internaitional attention durin the 2010–11 UEFA Champions League. He wis namit PFA Players' Player of the Year in 2011 an 2013, an wis namit in the UEFA Team of the Year in 2011 an 2013. Bale haes receivit plaudits frae his peers, who hae describit him as a fitbawer wi "tremendous speed, great crossin ability, a great left fuit an exceptional pheesical qualities". Durin the 2012–13 saison he wis awairdit the PFA Young Player of the Year, the PFA Players' Player of the Year an the FWA Footballer of the Year awairds. Bale wis born in Cairdiff, Wales, tae parents Frank, a schuil caretaker, an Debbie, an operations manager; he attendit Eglwys Newydd Primary School at Whitchurch. He is the nephew o umwhile Cardiff City fitbawer Chris Pike. It wis while at this schuil he first came tae the attention o Southampton at age nine, when he wis playin in a sax-a-side tournament wi his first club, Cardiff Civil Service Football Club. Growin up, his fitbaw hero wis fellae Welshman an Manchester United player Ryan Giggs. Bale attendit Whitchurch High School in Cairdiff. He wis a keen athlete an played fitbaw alongside future Wales rugby captain Sam Warburton, rugby, hockey an excelled at athletics. As a 14-year-auld he says that he ran the 100 metre sprint in 11.4 seiconts. Acause o his superior fitbawin skill, the schuil's PE teacher, Gwyn Morris, haed tae write special rules which restrictit Bale tae playin ane-touch fitbaw an no uisin his left fuit. Whilst at Whitchurch, Bale trained at Southampton's satellite academy in Bath, awtho thare wis initially some dout if Southampton wad gie him a scholarship due tae his hicht. "Gareth has a fierce determination tae succeed and has the character and qualities tae achieve his personal goals. He is one of the most unselfish individuals that I have had the pleasure tae help educate." Bale lives in Madrid wi his pairtner Emma Rhys-Jones, his heich schuil sweethert. Thair first bairn, born at the University Hospital of Wales, Cairdiff on 21 October 2012 wis namit Alba Violet. ↑ "Riise: Bale is world's best left winger". ESPN Soccernet. 10 November 2011. Retrieved 30 December 2011. ↑ "Gareth Bale has everything says Tottenham manager Harry Redknapp". BBC Sport. 28 December 2011. Retrieved 29 December 2011. ↑ "Gareth Bale – Tottenham Hotspur's Speed King". Nasty Tackle. 2011. Retrieved 13 November 2012. ↑ 7.0 7.1 Rollings, Grant. "Bale Model". The Sun. News Group Newspapers. Retrieved 14 November 2010. ↑ "Bluebirds of a feather are flockin thegither". Wales Online. Media Wales. 8 December 2008. Retrieved 8 December 2008. ↑ "Mentor's advice tae Gareth could come tae fruition as foreign legion close in". Wales Online. 22 October 2010. Retrieved 28 December 2010. ↑ 11.0 11.1 Harvey, Chris (31 January 2011). "Gareth Bale interview: born tae run". The Telegraph. Telegraph Media Group. Retrieved 31 January 2011. ↑ "Powerleague Official Opening". Whitchurch High School. Retrieved 5 September 2011. ↑ 13.0 13.1 "Pride at Cardiff school that developed Sam Warburton and Gareth Bale". guardian.co.uk. Guardian News and Media. 13 October 2011. ↑ "Twenty-five goals between 12 October tae 21 December are ruled on". Dubious Goals Panel rulings. Premier League. 12 January 2012. Retrieved 3 February 2012. ↑ 21.0 21.1 "Gareth Bale International statistics". Int.soccerway.com. 2013-01-09. Retrieved 2014-04-17. ↑ "Gareth Bale | Tottenham Hotspur News and Supporters Forum". Tottenhamhotspurs.tv. 1989-07-16. Retrieved 2014-04-17. ↑ "Gareth Bale named Wales' player of the year". BBC Sport. 4 October 2010. Retrieved 4 October 2010. Wikimedia Commons haes media relatit tae Gareth Bale. This page wis last eeditit on 5 Apryle 2019, at 13:39.